I am going to have to re-think my fruitcake categories. The "Other" category needs to be redefined a bit. I was recently asked about trends in fruitcake, which I hadn't really thought about before (and shame on me for that). What I came up with in response to that question was the trend of remaking the concept of a fruitcake, normally through rejection of the standard-issue candied fruit. Instead, I'm seeing (or at least being made aware of) more cakes that contain either house-made candied fruit, in the case of the Robert Lambert cakes, or dried fruit, such as the Old Cavendish cake. Perhaps this isn't a trend at all but rather something that's been out there for a while, and I've started to discover it as I surge further into the dense forest of cakes of a fruity nature. Regardless, I think this type of fruitcake deserves a category more defined than "other." I would welcome your recommendations as to what this new category would be. Dried-fruit fruitcakes? Gastronomic fruitcakes? Locavore fruitcakes? New wave fruitcakes? Feel free to comment or jump over to the Facebook page to share your thoughts. In any case, such a fruitcake is the WHO Women Cranberry Orange Walnut cake. Even by its name can one see that it is not defining itself as a fruitcake. Just as no one names a child Adolf anymore, it seems that the very word "fruitcake" might have negative connotations and so is being avoided. That being said, this is one of those alternative cakes that doesn't strictly evoke the flavor of a traditional fruitcake, either. Several readers had recommended this cake; when I went to their site, I didn't see anything specifically called a "fruitcake" so I contacted their customer service and was told that the Cranberry Orange Walnut was the closest thing. No hole. I'm not super keen on that (see my previous post about the importance of the hole), but really, not a huge deal. The ingredients? Fabulous: orange peel, dried cranberries, walnuts, brown sugar, flour, dates, butter, eggs, vanilla, a bit of sodium caseinate (not sure if that's part of another ingredient or added for emulsification/stabilization). What? No cherries, citron, pineapple, you say? Correct--this does not contain the standard trinity of candied fruit. Chock-full of all the good stuff. As for the flavor: it's not a standard fruitcake. This cake reminded me of the cranberry-orange quick bread that you may be familiar with, with a bright, citric flavor from the cranberries and orange peel. However it is much denser and has a more intricate flavor due to the walnuts and dates. I'd compare this to the Bien Fait cakes in nature because of the use of dried fruit. 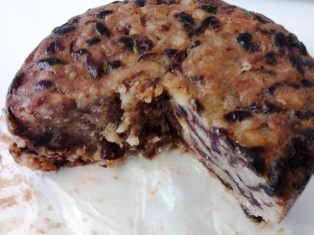 Hmmm, maybe that new category I mentioned is dried fruit cakes (rather than candied fruit cakes). 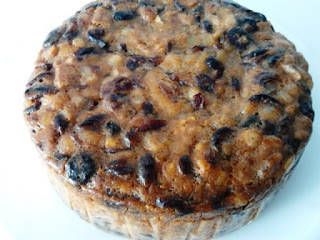 This is a very delicious cake, and could be another good alterna-fruitcake on your holiday table. It might be even more delicious with a discreet dousing of rum or brandy. I'm going to put it up towards the top of the "Other" fruitcakes list, but beware: my rating lists may be evolving soon! My suggestion for the new category: "fruit and nut cake". It fairly describes the 3 cakes you want to put in the category, it sounds like it might be different from "fruitcake", but not necessarily, and it has been used before, even as a euphemism for "fruitcake" (just Google on "fruit and nut cake" to see). A disadvantage is that many fruitcakes would also fit the description of the new category. If this cake was made by the ladies in Burnsvile, NC, please let me know how to contact them.